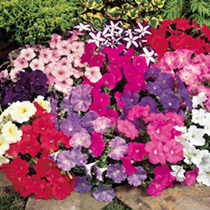 A unique, early flowering petunia with a low growing, spreading habit, excellent for ground cover. Many bright colours. Height 20-25cm (8-10"). HHA - Half-hardy annual. Multiflora variety. We recommend the excellent 'Carpet' series and unlike many in the seed trade offer single colours in addition to the mixture to help you design your own colour schemes. Ideal for beds and borders, patio pots and containers, hanging baskets. Prefers full sun. Medium-sized single flowers carried on compact, spreading plants. Very free-flowering and resistant to poor weather.